Oh me….I’ve found myself in a time travel tunnel today and have no idea where I am! On Saturdays, I like to take a little trip. Today, I have no idea where I am. 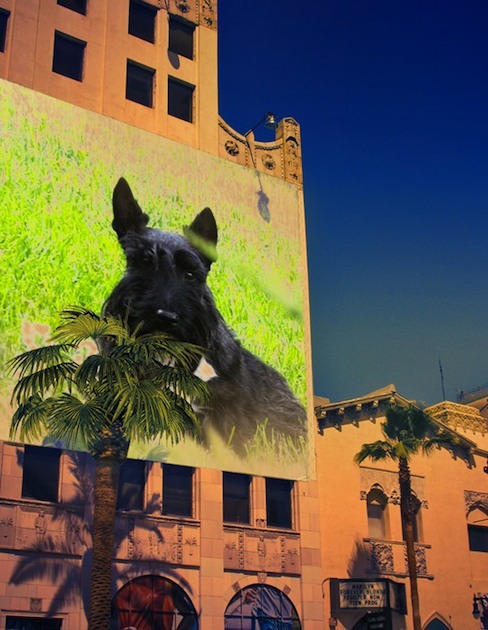 This entry was posted in The Scottie Chronicles and tagged photography, Scotties, travel. Bookmark the permalink. 10 Responses to Where in the World? My Peep has to buy a better magnifying glass! Thought I could cheat and read the words on the marquee but I couldn’t make them out! But based on the trees maybe you’re in Hawaii or California? I’m going to do it by process of elimination. So far I’ve eliminated Antarctica and Alaska. We shall guess Spain or Morroco – wild guesses, but guesses just the same. Ohhhh I like Morroco! that sounds exotic! Love the picture of you Stuart! Holy guacamole! Are you in Riverside CA? It looks like the Mission Inn to me!! I hope you don’t get sunstroke up there ‘cuz it’s over 100 degrees there today!! I am in Orange County CA which is supposed to be cooler than Riverside, and it is 100 here right now! The only red and yellow we see in the Autumn here in So CA is from the fires everywhere!! It will be VERY hot here till about Dec. Last year we had no rain, therefore no “Winter”. Better skedaddle to somewhere there is AC–and as fast as your short li’l legs can get you there if in fact you ARE(arf) in Riverside, (or SO CA, for that matter)! Ugh! Boo-hoo-aroo-o-o-o….